2018 Gary Allan Fan Party Tickets On Sale 3/1! 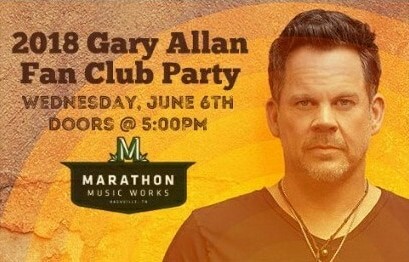 Gary Allan will kick-off CMA Fest with his annual fan party! The 2018 Gary Allan Fan Club Party will be held Wednesday, June 6th at Marathon Music Works at 6 PM. Doors will open at 5 PM. Members will be able to purchase up to 4 tickets; 2 member ($50/each) and 2 guest tickets ($55/each). Includes concert, food/beverage, surprise souvenir, and a photo opportunity with Gary. Click here to join the Gary Allan Fan Club Now (Membership is $20)!